This 18K gold plated statement ring with teardrop Rainbow Moonstone is one of our favorite eye catchers. It's bold, yet whimsical, ready for your everyday adventures and is adjustable in size. Read more.. 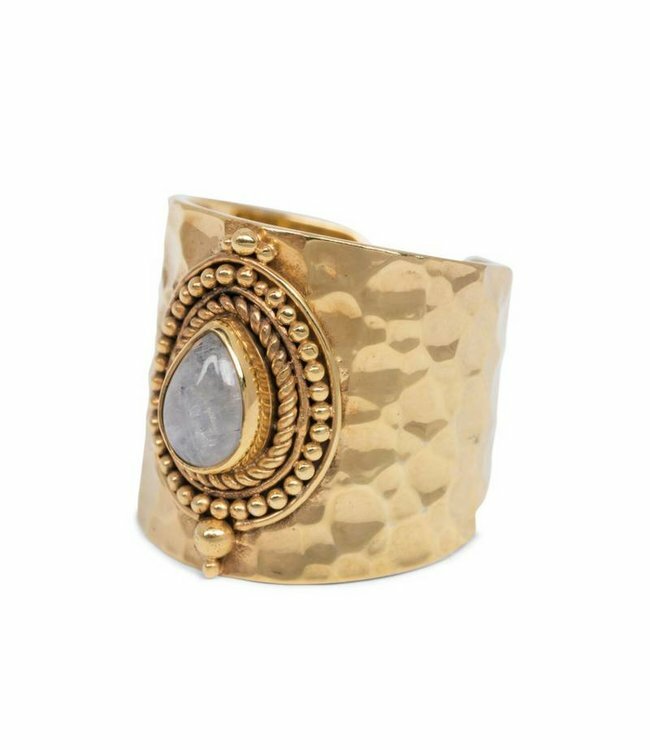 This gold statement ring 'Delilah' with teardrop Rainbow Moonstone is one of our favorite eye catchers. It's bold, yet whimsical and ready for your everyday adventures. It features Route508's signature style with rope detailing and teardrop design. 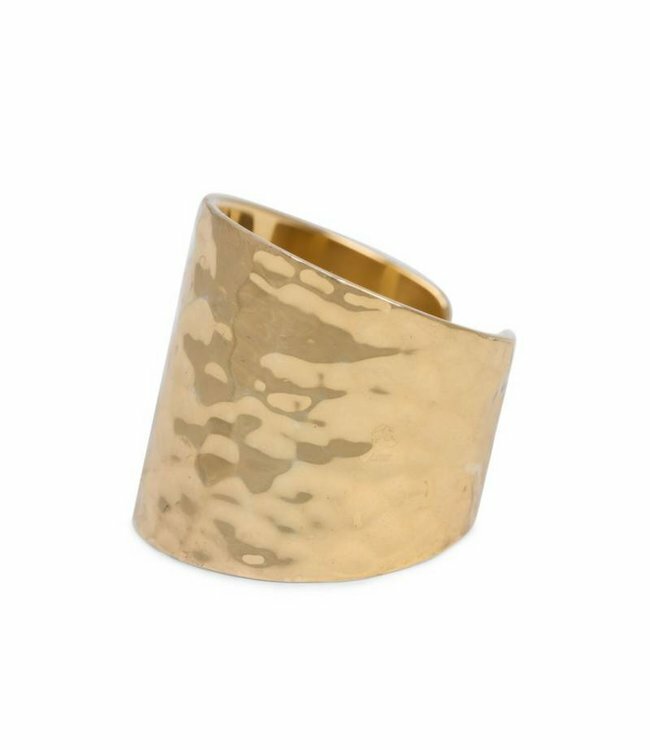 This 18K gold plated ring is handcrafted and finished with hammered detailing to give this gold ring an edge. It's boho chic, a bit of romance, mixed with a bold design. The ring has a comfortable and adjustable band and fits most sizes. You can easily adjust it from size 16 to a size 21. The natural gemstone we used for this ring is Rainbow Moonstone and measures 2,5 cm. Rainbow Moonstone intensifies your feminine 'Goddess' energy! It helps to strengthen intuition and enhances creativity, compassion, endurance and inner confidence. It is a stone that brings balance, harmony, and hope. The Rainbow effect brings in a spectrum of light, and can help with clearing and bringing in uplifting energies. This gold ring is part of Route508's first collection which is build around a sense of adventure, freedom and fun. All our accessories are bohemian inspired and handmade. This makes each item as unique as you are. 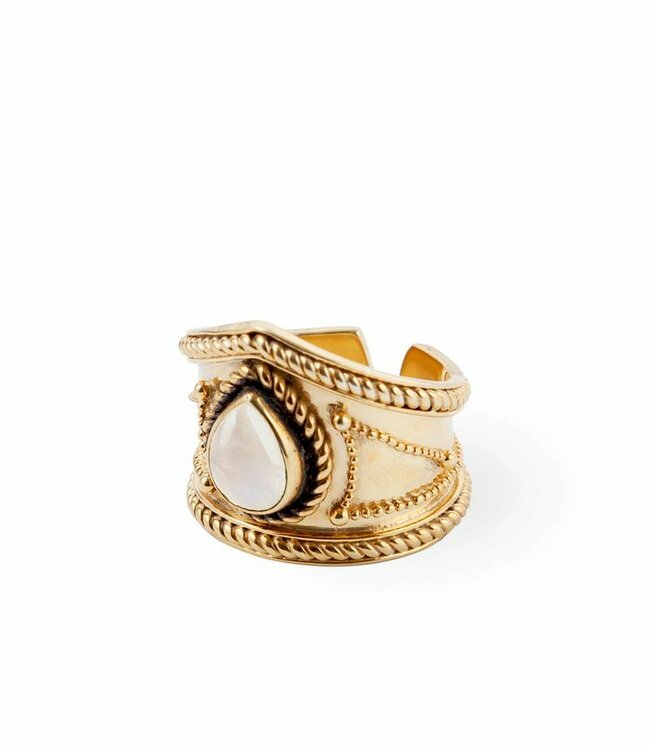 Get this Gold Moonstone Ring before 17.00hr and it will be shipped on the same day. This hammered Gold Vermeil Ring 'Sheila' with artwork extrav..